Go to original pattern for design DROPS Extra 0-785. 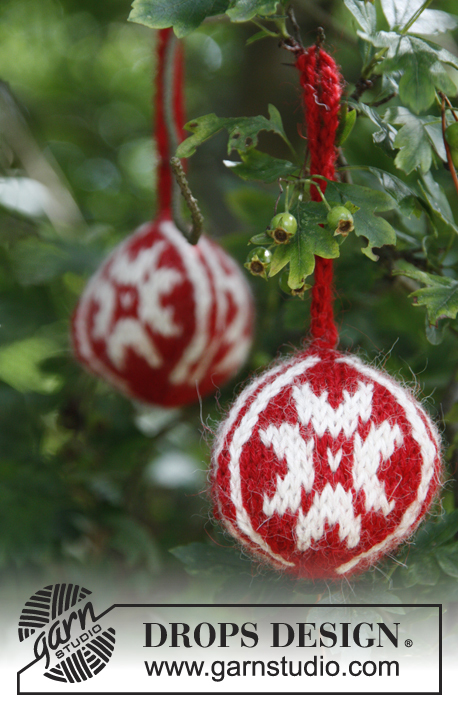 Knitted Christmas baubles with star in 2 threads DROPS Alpaca. Theme Christmas. One red ball = 3 Christmas balls. 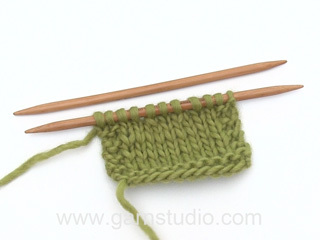 DROPS DOUBLE POINTED NEEDLES SIZE 3 mm - or size needed to get 26 sts x 34 rows in stocking st = 10 x 10 cm. DROPS CROCHET HOOK SIZE 3 mm - for strap. See diagram M.1. 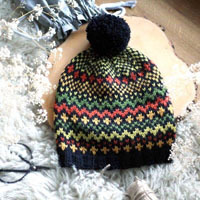 The entire pattern is worked in stocking st in the round on double pointed needles. On the right side of piece: M1L (with left needle from front pick up the strand between the 2 sts and work 1 st in the back loop of this new). On the left side of piece: M1R (with left needle from the back pick up the strand between the 2 sts and work 1 st in the front loop of this new st). Dec 1 st on each side of 3 sts off white/red/off white. Dec before these 3 sts as follows: Work until 1 st remains before the 3 sts and K 2 tog with off white. Dec after these 3 sts as follows: Work 2 of the 3 sts, slip 1 st (off white) as if to K, work 1 st with off white, psso. 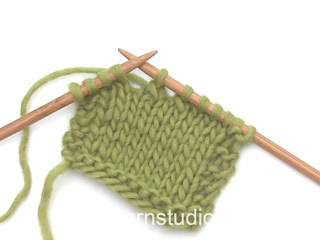 Work the ball in the round in stocking st on double pointed needles, bottom up. 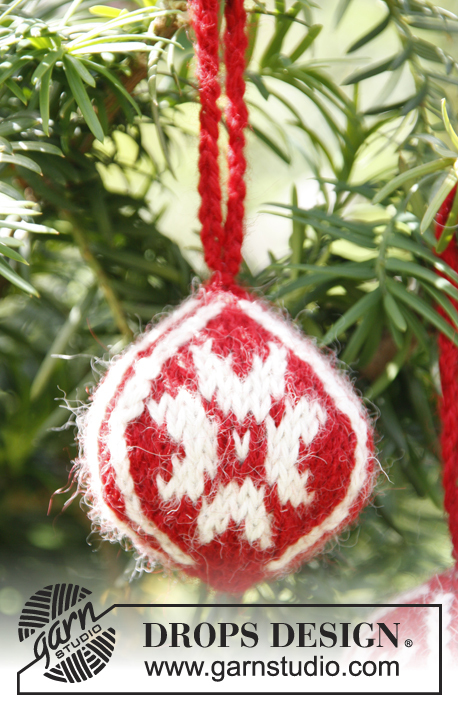 Cast on 6 sts on double pointed needles size 3 mm with 2 threads red Alpaca, 2 sts on every needle. Work 1 round. On next round, inc by working 2 sts in every st = 12 sts. Then work pattern according to diagram M.1. Inc with red on each side of 3 sts off white/red/off white - see INCREASE TIP above. Dec on each side of the same 3 sts, see DECREASE TIP above. After diagram M.1, 12 sts remain. Fill the ball with some cotton wool. K 1 round with red. Cut the threads, leave approx. 50 cm - this is used for the strap. Pull threads through the remaining sts, tighten tog. Use hook size 3 mm and work a ch-row of approx. 16 cm. Work 1 sl st at the top through. Fasten off. 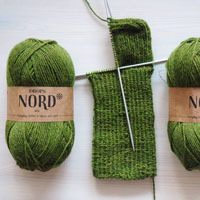 Dear Mrs Gutman, just click here to get the pattern Nordic Paws. Happy knitting! Thank you. So confusing. 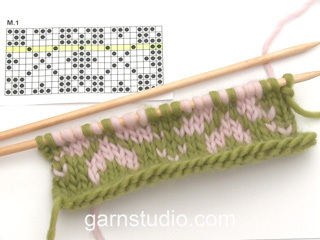 The pattern says cast on 6 sts, but you wrote start with 4. Which is it? Are there a total of 4 verticle whites- 2 on each side of the two M1 patterns? Dear Nell, you cast on 6 sts, then work 1 round over thesse 6 sts, then work the next round with inc = 12 sts. 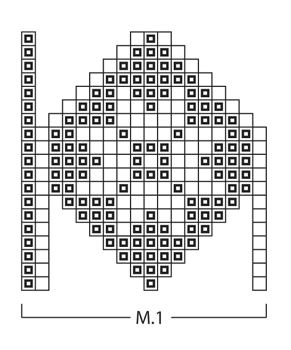 Then repeat M.1 a total of 3 times over these 12 sts (= M.1 = 4 sts worked a total of 3 times in the round, you will repeat it 3 times over the 12 sts. = you will have a total of 3 stars around the ball. Happy knitting! Thank you, still confused. I have been knitting for 40 years, and this just doesn't make sense or be so complicated. 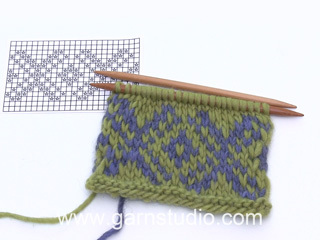 There are 18 rows in total for this pattern from start to finish, correct? Row 1 of 18 knit over 4 stitches is 1 white, 1 red 1 white, 1 red, increase in each of the red stitches for row 1? Dear Nell, Diagram M. 1 is a total of 19 rows (= 7 rows with inc, 5 rows "straight", 7 rows with dec) - and correct the increases will be worked with red, on row 1 work: *K1 with white, inc 1 with red, K1 with red, inc 1 with red, K1, with white, K1 with red*, repeat from *-* a total of 3 times in the round. Happy knitting! Thank you for answering onenof my questions but I still do not understand the rest of my question that wasn’t answered. 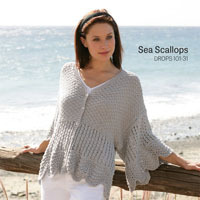 M1 has 18 stitches to the pattern/ 18 rows. After the first increase of 2sts/ 6= 12, there isn't another increase until row 9 of the 18 rows so there won't be enough stitches to knit on to get to row 9. Dear Nell, M.1 is starting first over 4 sts, then you increase every round until there are 18 sts (= 7 rounds with increases), work a total of 5 rounds over the 18 sts as shown in diagram and then decrease every round until there are 4 sts left in M.1 (= 7 rounds with increases). Hope this helps. Happy knitting! 1) Why do I use 2 strands of red, but only 1 of white? 2) M1 has 18 stitches to the pattern/ 18 rows. After the first increase of 2sts/ 6= 12, there isn't another increase until row 9 of the 18 rows so there won't be enough stitches to knit on to get to row 9. Dear Mrs Gutman, the balls are worked with 2 strands, ie 2 strands red and 2 strands white for the pattern. You will increase with red on each side of the 3 sts (= off-white/red/off-white) as explained in the written pattern, and then decrease on each side of the same 3 sts. Happy knitting! U breit deze met breinld zonder knoop (sokkennaalden). Deze komen in setjes van 5 naalden. U kunt zelf kiezen of u met 4 of 5 nld gaat breien, wat voor u het beste uitkomt. Veel plezier. Bonjour Danièle, M1 se tricote sur les 12 m, soit 3 fois le motif tout autour. Comment fait-on la 2° face de la boule ? En même temps ou après ? Merci.